The best picnic sandwiches that are customizable, craveable and incredibly easy to make! Bake bread according to package instructions. Slice bread to size and in half. Brush on butter while warm and sprinkle with fresh cracked sea salt. Add cheese, lunch meat and any additional toppings. These sandwiches are perfect for parties, picnics, eating on the go and more. 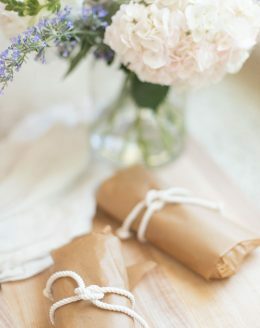 Wrap in parchment paper & tie with a ribbon for guests! Look for take and bake bread in your grocers bakery department.